A 3 hour workshop now available as a download! 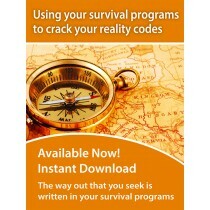 Over the years I have shared quite a bit about the survival program and how deep it runs. There is of course the core human survival program and our personal survival which are interlinked. This webinar will examine more deeply the fabric of survival and how we can begin to utilize those skills in our quest for individual evolution. Life is an incredibly coded experience with much time being spent on distractions while the solutions before us become blurred or invisible. Many of you are aware that we as humans now operate from the fight or flight mode most of the time. This ongoing sense of survival and urgency keeps the sympathetic nervous system hard at work, stimulating the fight or flight response. This completely takes control of the body triggering the production of adrenaline, norepinephrine, and cortisol hormones which are then released into the bloodstream. So we basically live in a state of emergency most of the time. How do we now decode and convert this survival opportunity. The recent webinar on “struggle” made evident our internal battles and our commitment to them. This workshop will be much like using all your leftovers to make a great dish! Have you been the backseat driver or at the wheel? Are you ready to own the responsibility of your journey? Come and be part of this workshop but come with an open mind, come with an intention for utilizing this information. This is going to be yet another eye opening experience!